One evening last week, as I sat on the dining room floor scraping up pieces of smashed string cheese after an especially long work day (11.5 hours, if we're counting), a raging headache all but eating my brain, my toddler decided it was (clearly!) the perfect time to dump a cup of sticky apple juice all over herself - just minutes after I'd given her a bath and put her in fresh pajamas. She shrieked with joy, and I held back tears. My husband had just left for more of the band's summer tour, it was way past her bedtime, and although the situation itself was pretty comical and certainly not a real problem by any means, it got to me. It had been one of those weeks that had pushed my limits, and I was exhausted. As I pulled myself off the floor to tend to my juice-covered daughter, who was now gleefully rubbing the apple juice into my favorite area rug, I glanced outside to my deck - my summertime happy place. And I instantly realized that I needed to take some time for myself the following day. There would be no desperate shoving of extra work or chores into nap time. Tomorrow, nap time was going to be me time. Here's the thing about summer you guys. I go on and on, both here on the blog and in real life, about how much I adore it. I gush about all of summer's most ethereal stereotypes, from dancing barefoot in the dewy grass to watching fireflies kiss the night sky. But I'll fully admit that at least part of my love for summertime centers on an idealistic image that I have in my head, gathered from childhood memories that took place well before I ever had real responsibilities. In reality, summer these days is insanely busy, full of toddler swimming lessons and play dates, a work schedule that is completely based on my husband's (one that is crazier than ever in the summer as a result of music festival season), projects around our house that must be squeezed into the warmer months, trips and out-of-town visitors, scraped knees and extra messes. There simply isn't a lot of time to live out those pretty summer fantasies to which I cling. But I realized that fateful day last week that it was up to me to make the effort to create time to enjoy summer, even if it meant just taking a short break by myself to sit out on my deck for a single blissful hour with my favorite magazines, some fruit, and a glass of freaking mint water, man. I was going to make this happen. The following morning, after swimming lessons, Essley and I headed to Target to get groceries and other miscellaneous items. 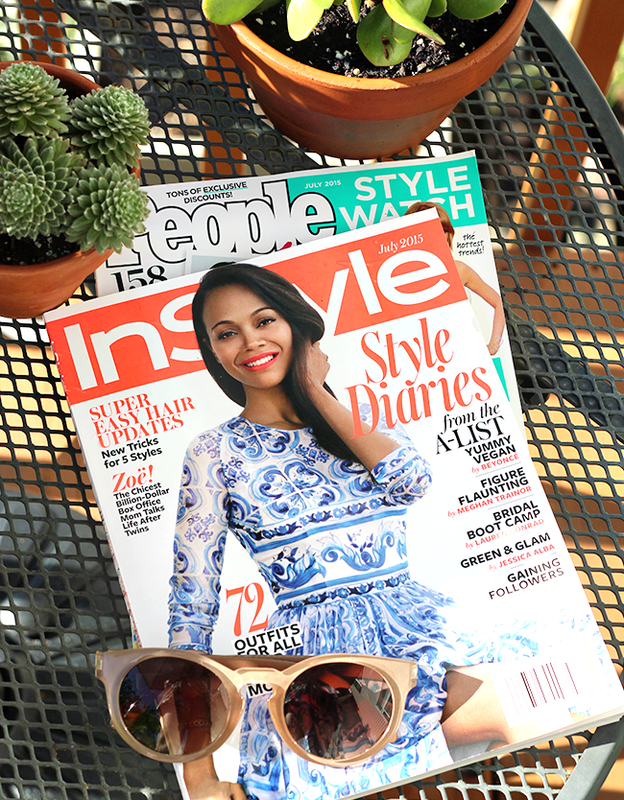 But the first thing I did when we walked in was head straight for the magazine racks to grab a copies of InStyle and People Stylewatch. 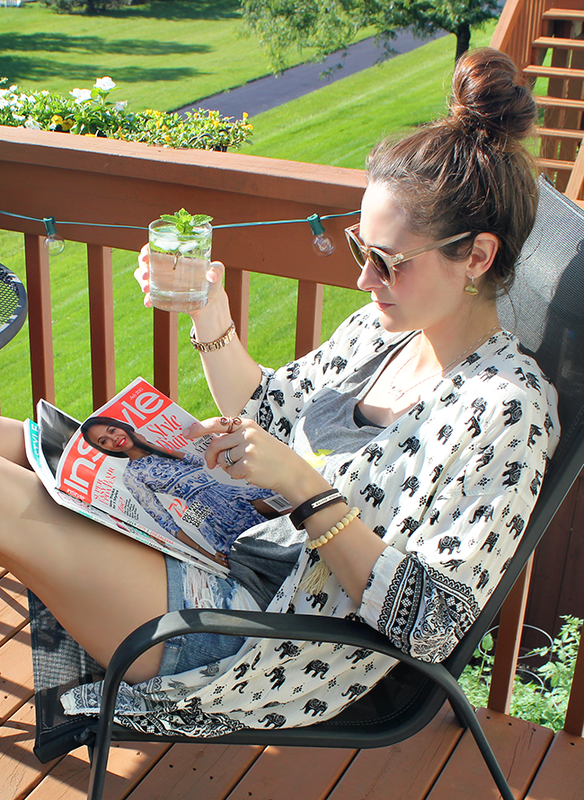 I had a plan, and that plan involved sunshine, a cool beverage, and some summer style inspiration. A few hours later, nap time finally arrived. She didn't go down without a fight, but I had my eye on the prize. 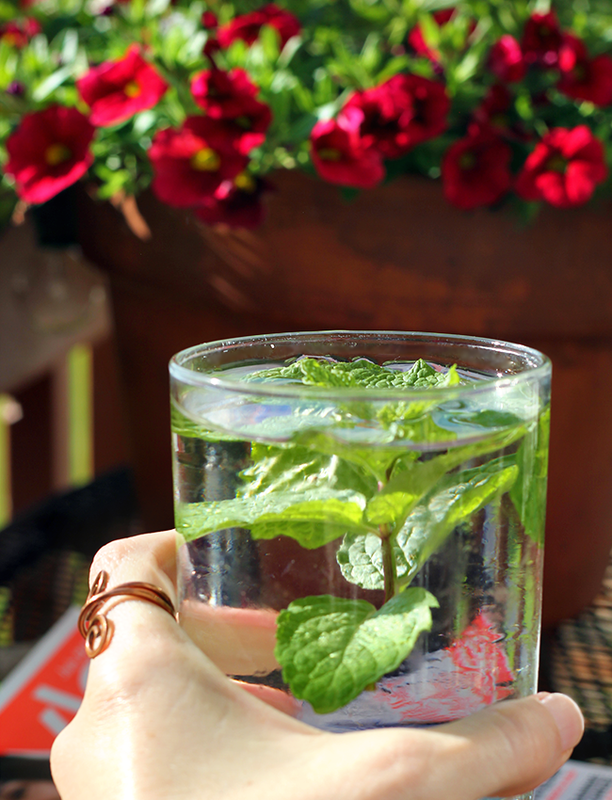 As soon as she was asleep, I poured myself a nice cold glass of water infused with mint from our summer container garden, filled a bowl with chilled grapes, piled my hair into a topknot, and stepped outside into my sweet summertime oasis. I put my feet up, leaned back, took a deep breath, and leisurely flipped through my magazines, pretending that I didn't have a care in the world. And you know what? It worked. By the time Essley woke up from her nap, my mind was clear, and I felt rejuvenated and inspired. 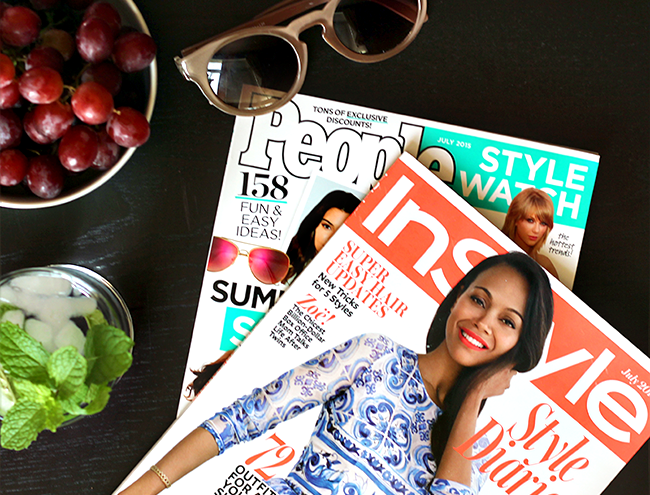 I relished every moment and every page, soaking in the perfect prints and patterns for my summertime wardrobe, the fresh monochromatic makeup look that's in for summer, and the best pieces to pack for summer trips. It was a super relaxing, seriously needed escape from the real world, and it reminded me how crucial it is to take breaks to just enjoy some time with myself during this hectic time of year. 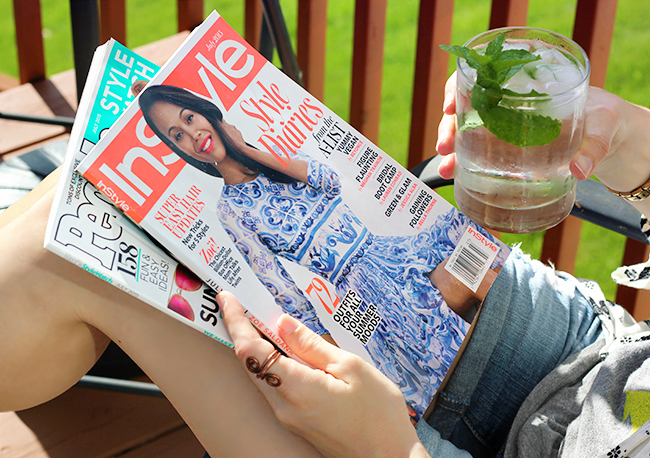 If you're in need of summer me time too, you can save 20% off InStyle® and PEOPLE® StyleWatch mags (as well as PEOPLE® and Us Weekly®) by using the Target Cartwheel Digital Offer. Also, you can receive 20% off special edition magazines. Both offers are available until 7/10/15 (while supplies last). I took full advantage of this offer when purchasing my mags, which was a sweet added bonus to my little summertime break. Does summertime seem to be crazier for you than other times of the year? 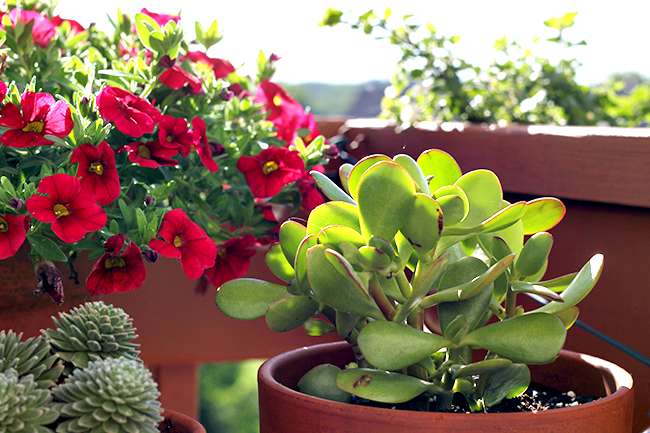 What kinds of things do you do to take time for yourself during the summer months? Thank you for supporting Bubby and Bean by allowing us to post occasional sponsored content. I've been getting out of the house more lately too. I tend to work, work, work. But after all that crappy rain, I was really craving some time outside in the sun. I've been taking 30 mins. to an hour each afternoon to just sit outside and relax. I just wish we had an awesome deck set like yours :) And Friday night I drove to town to take a nice long walk. It was so relaxing and just what I needed! We get a lot of rain, even in summer, so as soon as the sun comes out I literally drop everything and sit outside to soak up the rays while trying hard to ignore the niggling feeling that I ought to be working ;-) I get it! I have not been taking much time for myself lately, but I really need to! Work has been picking up a lot, which is normal because people do home projects in the summer, but I'm really wiped out now. 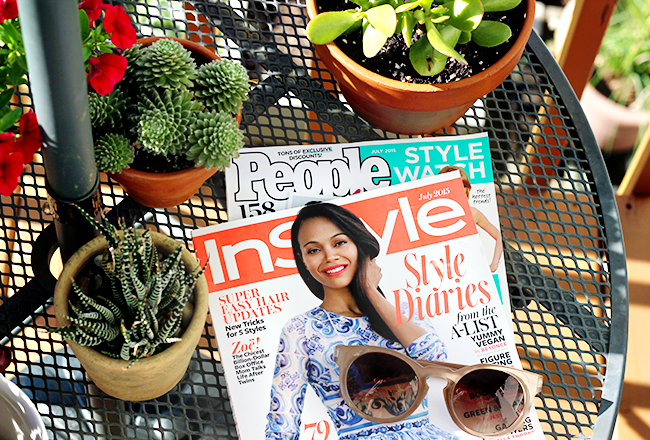 An hour or two in the sun with a magazine sounds awesome. I don't know how you do it all, Melissa - juggling multiple responsibilities including running a blog is hard enough, without adding a toddler into the mix! It sounds like you definitely needed and deserved this time for yourself. And I just have to say, that elephant print kimono is too cute. wow great summer moments. its looking very comfortable and fresh. sunglasses are very important for summer. and cold water is so important for us in summer. any way thanks for nice sharing. Good for you for taking some time for yourself!! When my brain is fried and my nerves are frazzled, I love to look at pretty pictures -- sometimes in magazines, sometimes on Pinterest. I've also resolved to get out on my deck one of these days. The longest day of the year has come and gone---so we're on that steep downhill careening slope to the holidays. Got to enjoy these precious summer days NOW! Glad you got your well needed day of rest! I'm full of jealousy!